The constables and junior officers of the Mounted Police serving at Herschel Island were agents of the national state. 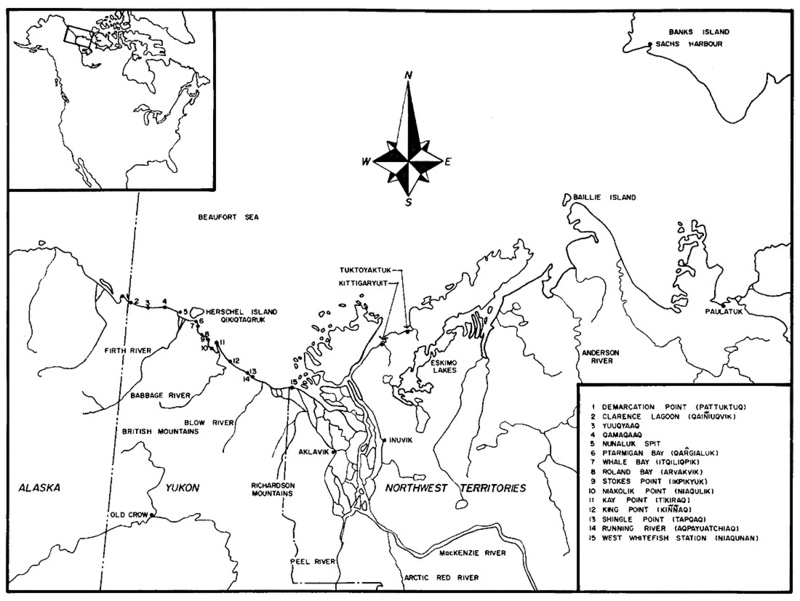 While at Herschel Island they attempted to express the interests of Canada meaningfully in the local conditions they experienced at the extreme northwestern corner of the country. These interests included the establishment of a national presence through the enforcement of Canadian law, the protection of the country’s commercial interests, and the extension of state services to the region. At the same time, however, they had to intervene in the complex cultural contact involving the North Slope Inuvialuit, now divided by a national boundary, and southern whalemen, fur traders and gold miners looking for wealth, Christian missionaries seeking to save souls and a government struggling to transform hunters into citizens. Inuvialuit Camp, Yukon North Slope, RCMP patrol in spring, 1954. Lucy and Special Constable Billy Cockney L, Kitty and Old Roland R at Ptarmigan Bay. Hickling, 153, PC. 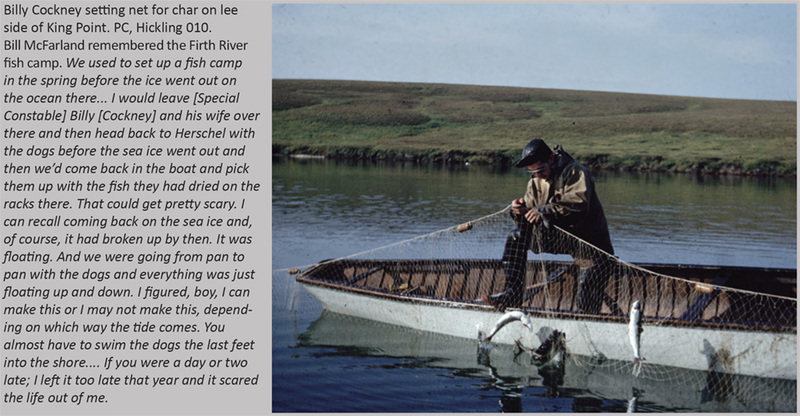 For the inexperienced young men posted to Herschel Island as Mounties between 1903 and 1964 these challenges were compounded by the demanding climate and geography of the region and their isolation from the familiar world of farms and cities in which they grew up. For at least some of them, it was one of the most interesting and exciting experiences of their lives. Although mapped and named in 1826, newcomer interest in Herschel Island only began much later in the century. American whalemen arrived from the west to chase bowhead whales in the late 1880s. In 1892, Bishop Reeve of Mackenzie Diocese asked Isaac Stringer, then newly arrived in the western Arctic, to visit both whalemen and aboriginal people at Herschel Island in 1893. Despite their disparate purposes both missionaries and whalemen had an interest in the arrival of a state authority. Bishop Bompas of Selkirk (Yukon) Diocese, then living in Dawson City, wrote frequently to Ottawa requesting a police presence to control contact between the two cultures. By the same token the whaling fleet, often over-wintering at Herschel Island, appreciated a level-headed neutral third party to mediate disputes between the ships’ captains and their often restive crews. Traders in the Mackenzie delta also added their complaints when whalemen, bringing in much cheaper trade goods directly from San Francisco and avoiding customs duties, undercut the fur market in the region. There was, however, little appetite in the 1890s for the dispatch of a police force to the western Arctic. The severe economic depression of the time meant government coffers were low and the commitment of a significant Yukon detachment to police the Klondike gold rush pushed the capacity of the Mounted Police to its limits. The petitions were ignored. However the unsatisfactory, for Canadians, outcome of the Alaska Boundary settlement in late 1903 caused a nationalist furor and the Dominion government responded quickly. Before the final boundary agreement was even completed a small and poorly equipped Mounted Police detachment was sent north. They arrived at Herschel Island in late summer and camped there into the fall. The following year a permanent detachment was established with connections to the Yukon detachment at Dawson. Early police work focused on monitoring the whaling and becoming familiar with the Inuvialuit in the region. In 1910 Herschel Island was made the subdistrict headquarters for the Mounted Police in the western Arctic. As such it became the base for a regular set of extensive patrols along the North Slope to the Mackenzie delta and south to the Porcupine River and Old Crow. One of the earliest of these long dog trips was undertaken by Inspector G.L. Jennings in 1910. His trip diary records the difficulties of travel, regional place names and the presence of aboriginal people. Curiously when his report was published in the Mounted Police report to Parliament for 1911, much of the geographic description was retained, but most of the references to people he met disappeared. The land was emptied of people and its potential as territory highlighted. This however was only true for people far away. For the Mounted Police on patrol the knowledge and land skills of aboriginal people were crucial for their survival. In 1909, the Herschel Island police hired their first special constable. It was the co-operation of the Inuvialuit, both those working as specials and the general support the Mounted Police obtained from the local population, that made effective police work possible on the North Slope. The police administered the law and extended the reach of British justice, most seriously to allegations of murder. Anxious to extend order and end what they perceived as savagery, the police investigated and brought to trial suspicious cases. After courts in southern Canada had been lenient in early murder trials, dangerous precedents from the police perspective, there was a growing determination to demonstrate the meaning of the law to the “Eskimo.” In 1923 a number of murder cases were tried at Herschel Island. Two Koglucktuit men, Tatamagana and Alikomiak, were convicted of killing a policeman and Hudson’s Bay Company trader, and executed in February, 1924. The lesson however was misconstrued by many in the audience. Recent interviews with elderly Inuvialuit women, who would have been young girls at the time of the trial, indicate conflation of these cases with an infanticide conviction of a few years afterwards. These women remembered the seemingly random application of law. They recalled that white men often took Inuvialuit girlfriends but dropped them when they became pregnant. The women asserted that the police would then threaten to put them in jail and hang them unless they married an Inuvialuit man. Cross-cultural understanding of justice took a long time to bridge this gap. “Old Irish”, Bill McFarland and Neil Allen at the RCMP detachment, Herschel Island, early 1950s. PC, Hickling 001. The fur trade and national sovereignty represented by the Mounties intertwined in the 1910s and 1920s. A plentiful population of white fox in the region and high fur prices drew traders into the area. 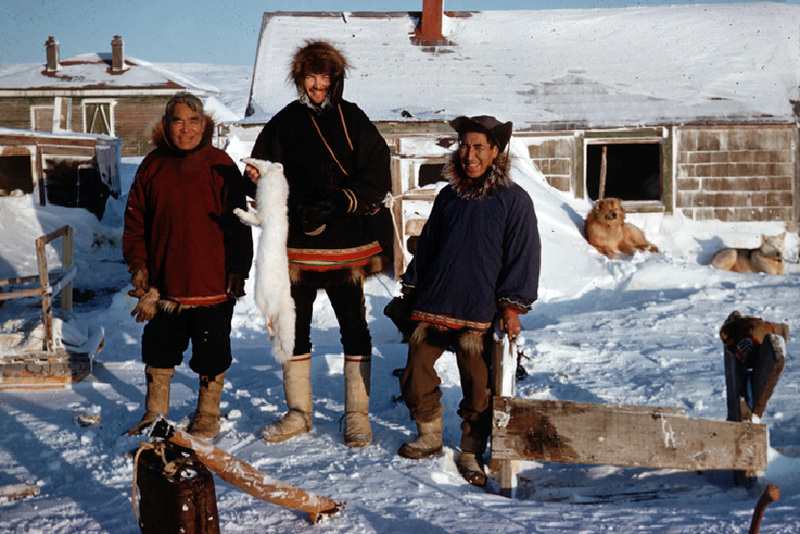 Itinerant American traders continued to “poach” Canadian furs until regulations were tightened to prohibit ship borne trade and the Hudson’s Bay Company established trading posts on Herschel Island, in 1915 and, briefly, at Clarence Lagoon, very near the international boundary. By the late 1920s the ship traders were gone and Inuvialuit trappers gradually retreated to the trading posts at Barter Island and into the Mackenzie delta. Consequently the importance of the police post at Herschel Island diminished. In 1931 the Mounted Police subdistrict headquarters was transferred from Herschel Island to Aklavik and the detachment was closed two years later. 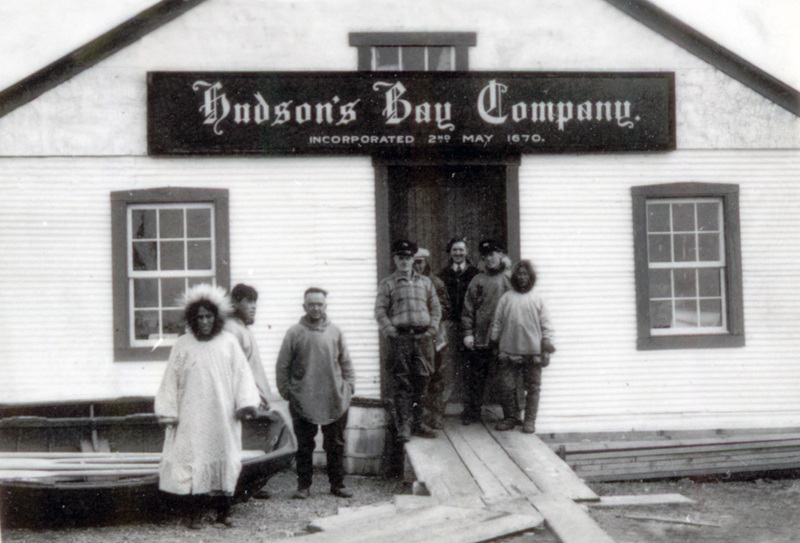 The HBC abandoned their trading post there in 1937. 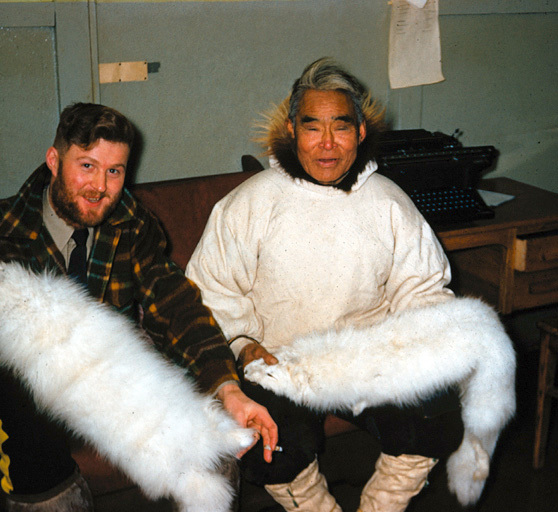 The white fox made Inuvialuit trappers rich. With their profits many purchased motor yachts to sail along the North Slope and over to Banks Island extending their harvest reach. In early summer Pauline Cove became a busy harbour as the schooners arrived, loaded with winter furs, to wait for the traders. 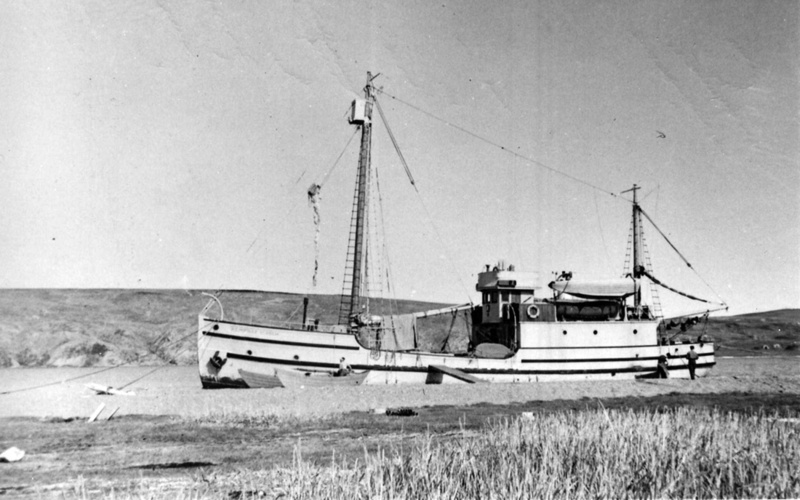 St. Roch at Herschel Island, 1947-48 voyage. VMM, HSDO-40-16. In order to police the region more effectively and enhance Canada’s arctic sovereignty the Mounted Police built more posts and acquired a large motor schooner, St. Roch, in 1928. St. Roch patrolled widely in the western and central Arctic for twenty years, frequently overwintering and acting as a mobile detachment in the central Arctic. Its most important voyage was the first west to east transit of the Northwest Passage in 1940-42, which also had, at least briefly, a top secret war mission. As part of securing the North Atlantic from Nazi control the British had invaded Iceland in early 1940 and asked Canada to protect strategic mineral deposits in Greenland. Prime Minister Mackenzie-King, sensitive to President Roosevelt’s concerns of British overreach in the North Atlantic, appeased both by assigning the RCMP the task of invading Greenland and using St Roch, then in Vancouver, to be the Canadian military task force. Although the Canadian Greenland invasion was forestalled by diplomacy before the departure, the St. Roch continued its Arctic sovereignty patrol and made history. The first half of the twentieth century had seen significant changes to North Slope Inuvialuit material culture. 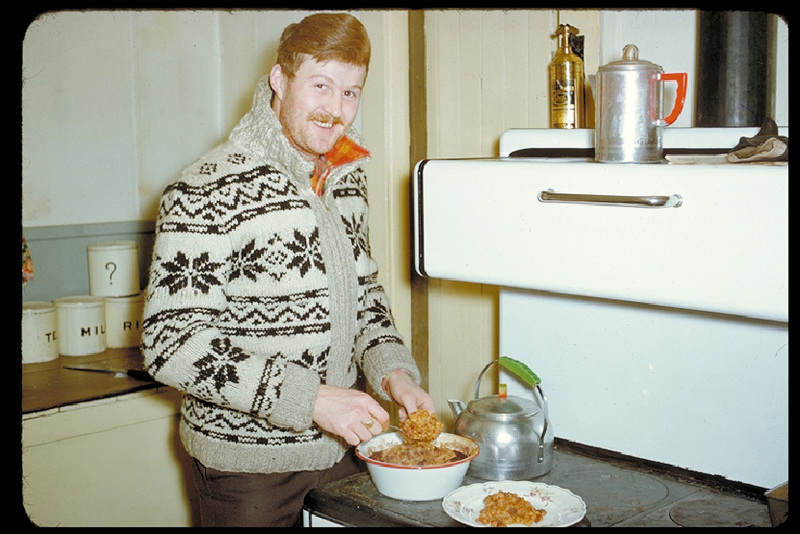 As early as 1910 Inspector Jennings noted how the Inuvialuit had incorporated tea and flour into their diet. Through the 1920s and early 1930s high fur prices for the abundant white fox allowed the Inuvialuit to become among the wealthiest people in Canada. They not only purchased rifles, fish nets and camp gear, they also commissioned the construction of motor yachts from the west coast. 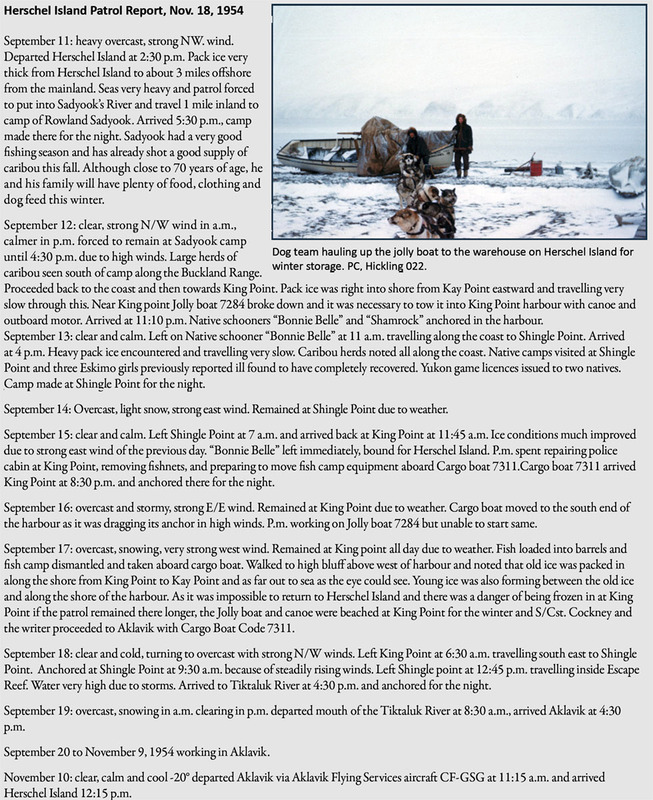 New government programs, a collapse in the fur market and changing role for the churches however led to dramatic changes on the North Slope after World War II. 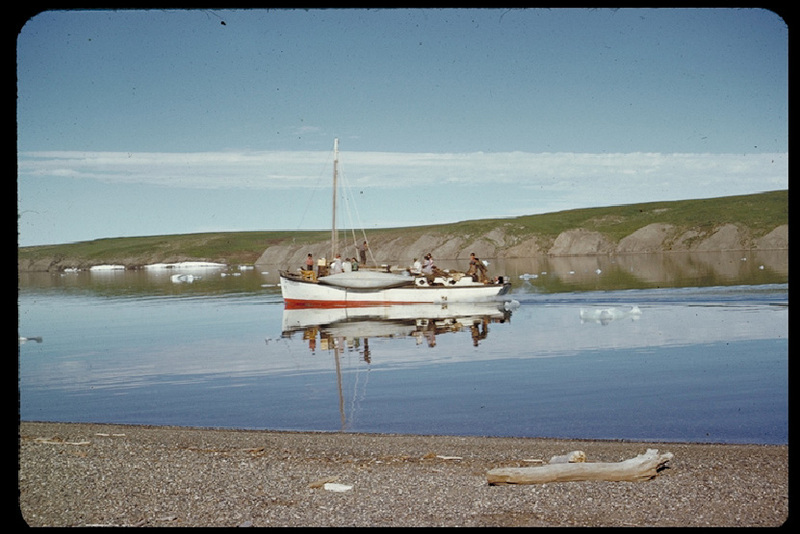 Inuvialuit Schooner at Herschel Island, early 1950s. PC, McFarland 006. The Mounted Police presence at Herschel Island and at similar posts across the Arctic was an important symbol of Canada. In the early years, the police were more a presence of Canada than a force for change. Gradually however the Mounties asserted Canadian law and extended government services as the local population grew accustomed to the cultural and social changes taking place. This was especially true after the Second World War. In the early days, the Herschel Island detachment registered the traders coming into the region and investigated criminal acts. Hunting and trapping seasons were enforced with increasing rigour as time went on, and there was a short term in 1949 as Mining Recorder for the Firth River prospectors. Relief supplies were provided to the aged or sick as necessary. 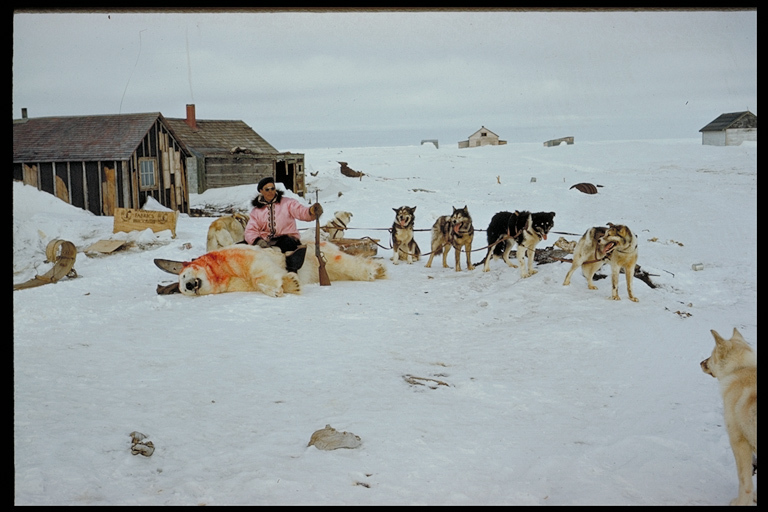 Perhaps the most important activity for Canada was the police attention to local trends and activities submitted in the annual report on the “Conditions of the Eskimo.” However, like the Inuvialuit around them, they appear to have spent most of their time working to stay where they were – catching fish for the dogs’ winter food supply, cutting ice for the summer water supply, keeping the buildings from collapsing (at least once spending several days looking for their outhouse when it had blown away in a gale), and spending huge amounts of time travelling, by dog or boat patrol, to see what was happening. The Bob Cockney family at RCMP detachment for Christmas, early 1950s. PC, Hickling 173. The Canadian government introduced the first elements of the modern social security network in the late 1940s. Family Allowance and Old Age Pension programs were implemented and extended to the whole country. This had an unexpected effect in the western Arctic when Inuvialuit families, who settled at Barter Island, Alaska in the 1930s, decided to move east to join their relatives in Canada. 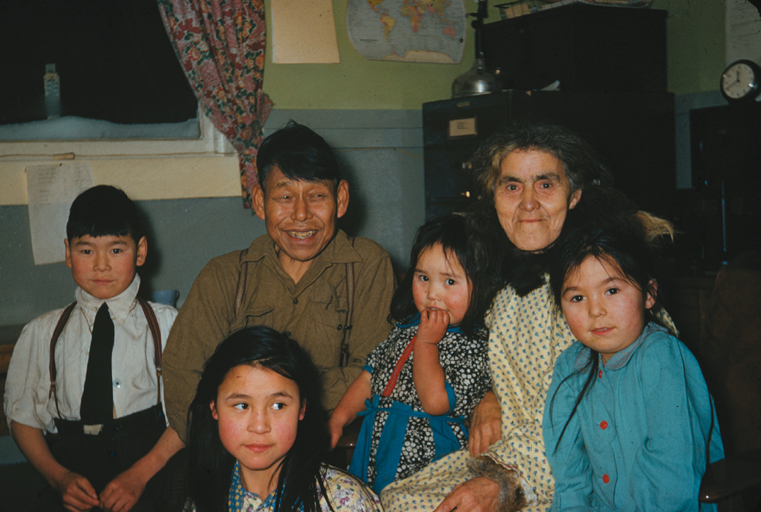 The migration of these families prompted the reopening of the Mounted Police detachment at Herschel Island in 1948. The coincident collapse of both the value and number of white fox on the North Slope complicated police work there over the next fifteen years. Traditionally the fur trade companies extended credit to trappers for the next year’s outfit. However with the poor business outlook for fur, the companies began refusing credit to trappers already deep in debt. These refusals included a large proportion of those Inuvialuit living along the North Slope. As recent returnees they had been left out of the allocation of registered trap lines in the delta and were not allowed to share trapping privileges there. Further, Aklavik had little room left for new residents and both the Catholic and Anglican schools were packed and unable to accept new students. Despite protests about the resulting hardships to these people by the Herschel Island detachment and RCMP headquarters, the trading companies argued the issue had nothing to do with credit but was one of relief and therefore a government responsibility. The Herschel Island detachment was instructed to keep these people on the land while alternatives were considered. As a temporary response, the police at Herschel Island were allowed to establish a trading store in 1950. With poor hunting conditions persisting through to 1953 many people became dependent upon the store. In 1951, eleven families (85 people) with 37 children collected family allowance as rations from the detachment. Relief rations distributed that year included flour, sugar, milk powder, matches, tea, baking powder, lard, ammunition (30/30 and .22), coal oil, macaroni, tinned tomatoes, rolled oats, prunes, rice, beans, and salt. In January 1951 the store obtained six white fox skins, two pairs of caribou mitts, a pair of caribou boots, a pair of seal skin slippers and two pairs of seal skin mitts. Old Irish and Jim Hickling trading white fox. PC, Hickling 164. 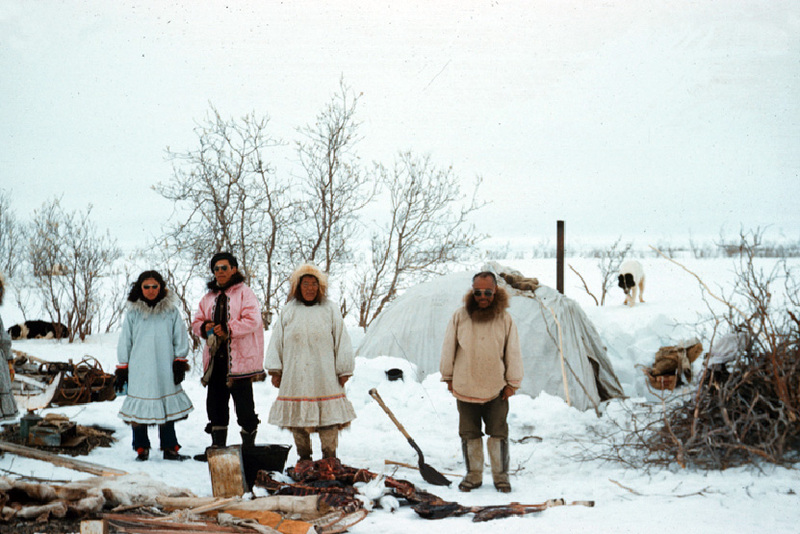 In the search for a permanent solution in 1951, Northern Affairs proposed that a large portion of the Inuvialuit population be relocated from the North Slope and the delta to Holman Island where game was reported to be plentiful. The Inuvialuit politely declined, confident in their abilities to make a living on familiar ground. However, when trapping and prices improved in 1954 the onset of a major storm in August the following year wiped out many of their outfits. Hickling, who sat out “a terrific storm” with northwest winds up to 75 mph and a great rise in water level near Shingle Point, reported that Gus Tardiff’s family nearby suffered a lot of damage, “losing their entire summer fish catch, meat cache, food stuffs and dog equipment.” The family moved their tent into the hills behind Shingle Point and were hunting the numerous caribou to get along until freeze-up. The schooner ”Red Mountain” was washed up on shore at King Point, and while it appeared undamaged the families of Alex Gordon and Daniel Kopuk were working hard to get it back into the water, many others lost fish nets and dog equipment. For many families the losses wiped out the last remains of the halcyon days of white fox wealth from the 1930s. Nevertheless there were alternatives. In 1949 a number of Inuvialuit replaced the cash from white fox by panning for gold during the short-lived Firth River gold rush. And by the mid 1950s many were employed as construction workers on the DEW (Distant Early Warning) Line across the whole of the Arctic. 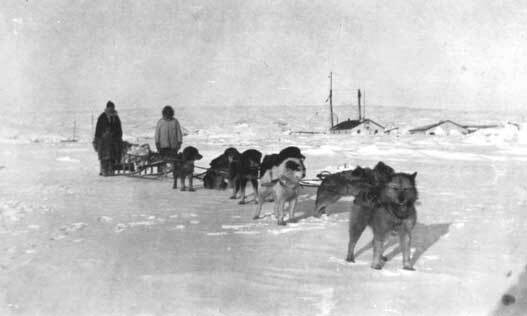 Constables McFarland and Hickling intercept the first truck train to the DEW Line site near Herschel Island. PC McFarland 074. The possibility of more jobs and the development of the town of Inuvik drew more of the Inuvialuit into the Mackenzie Delta and the North Slope gradually lost most of its already limited population. By the early 1960s, the Herschel Island detachment’s responsibilities had shrunk to occasional patrols to the DEW Line stations and the maintenance of a yard for sled dogs. With the onset of more reliable aircraft travel and the replacement of dogs with skidoos, even these functions disappeared and in 1964 the Herschel Island detachment was closed for the last time. Sundogs over Herschel detachment, early 1950s. PC, Hickling #065/066.